Ovals Design 10.25" White w/ Silver Oval Border Banquet Plastic Plates 10ct. Ovals Design 7.5" White w/Silver Oval Border Dessert/Salad Plastic Plates 10ct. 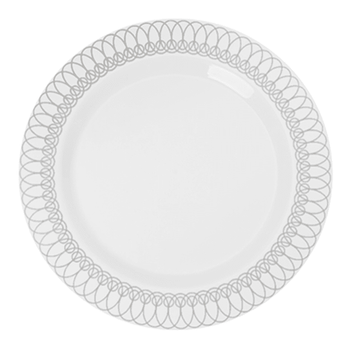 Ovals Design White w/Silver Oval Border 14oz. Plastic Soup Bowls 10ct.